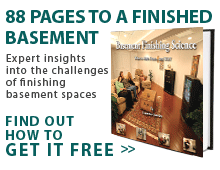 The Total Basement Finishing (TBF) system is made up of a product line with 25 patents and untouchable warranties. With inorganic flooring options and insulation, TBF dealers offer their customers quality products that outlast the typical carpeting and fiberglass options. Then there are the incomparable wall panels that are washable and inorganic so as to protect against damage from water, mold growth and wear-n-tear. Drywall can hit the road. Egress windows can give you more options on using your basement space as well. With the long-lasting benefits of the TBF system, you can expect to be investing in more than just a beautiful upgrade, but you're investing in a new living space, a healthy improvement, and a space that increases the value of your home in Nebraska. Did you know your basement can be a valuable asset? It might seem impossible to the homeowners with the moldy, wet, cold, and unfinished basements, but there's hope even for the homeowner with the worst basement imaginable. Your Nebraska basement finishing contractor will explore your basement and diagnose the problems, develop a basement finishing design that meets all your needs, and use the finishing products that distinguish our systems from all the rest. Contact the Total Basement Finishing dealer near you today for a free estimate for basement finishing in Nebraska.